PORTLAND, OR and VANCOUVER, BC – June 10, 2009 – Oregon Governor Ted Kulongoski will join Robert F. Kennedy Jr. at the opening today of the first commercial facility in the United States to incorporate innovative new technology that recovers phosphorus and other nutrients from wastewater and recycles them into environmentally-safe premium-quality commercial fertilizer. The new technology is located in suburban Portland at Clean Water Services’ Durham Advanced Wastewater Treatment Facility (Tigard, OR). Clean Water Services, a water resource management utility serving more than 500,000 customers in urban Washington County west of Portland, owns and operates the technology in an innovative public/private partnership with Ostara Nutrient Recovery Technologies Inc. of Vancouver. Developed by Ostara, the new technology provides benefits to Clean Water Services, its ratepayers and the environment by increasing plant capacity and reducing maintenance costs, while also creating a revenue-generating by-product. Clean Water Services and Ostara share revenue from the commercial sale of the fertilizer by-product, which is being marketed throughout Oregon and the Pacific Northwest by Ostara under the brand name CrystalGreen?. The Ostara technology has been operating at the Durham facility since May 2009 and is being officially unveiled today at a ceremony attended by government and business leaders. Speakers at the ceremony include Governor Kulongoski; Robert F. Kennedy, Jr., prominent environmental lawyer and a Director of Ostara; Roy Rogers, Clean Water Services Board of Directors; and Phillip Abrary, President and CEO (2005-2017) of Ostara. Bill Gaffi, General Manager at Clean Water Services, said that partnering with Ostara provides a solid return on investment for the utility and its ratepayers. Kennedy said the incorporation of the Ostara technology at the Durham plant is the kind of infrastructure solution needed in hundreds of municipalities across the United States. “Local and state governments should take note that the win-win benefits of improved economics and reduced environmental impact achieved here can be replicated throughout the United States. This will save money for your ratepayers and also reduce the impact your wastewater treatment plants have on the waterways and the water table in and near your communities,” Kennedy said. Abrary said Clean Water Services’ Durham facility is the first in the world to implement a full-scale commercial operation, where 100 percent of the wastewater stream is being treated with Ostara’s nutrient recovery technology. A municipal wastewater treatment plant in Edmonton, Alberta, has been operating with the Ostara technology for more than a year, however it is not a full-scale operation like the commercial facility in Oregon to be unveiled today. 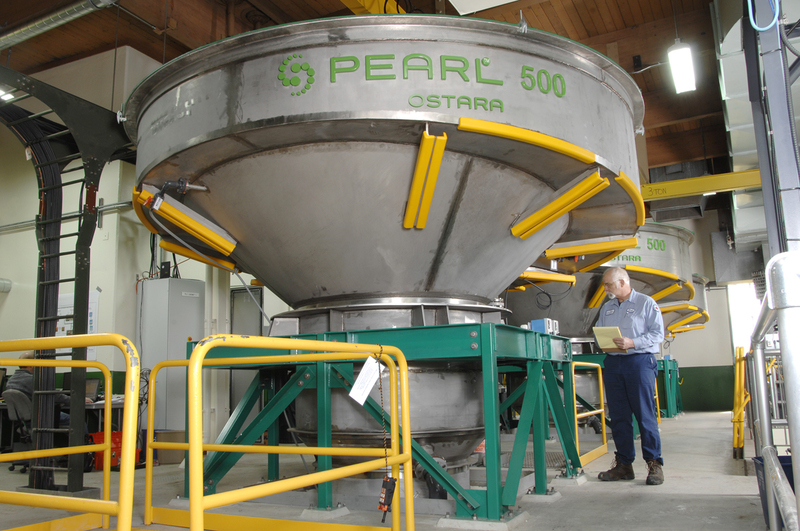 Several other commercial applications of the Ostara technology are in planning and design stages after successful field trials since 2007 by municipalities, ethanol biofuel plants and food processing plants in the United States and Canada. The Company estimates that approximately 200 plants in North America and several hundred plants in Europe and the rest of the world are candidates for the Ostara technology. Abrary said treatment systems typically separate sewage sludge solids from liquids. Treated solids can be recycled as soil amendments, as the Durham facility does. Liquids are typically reprocessed back through the wastewater system, which adds costs to the system by clogging pipes with a concrete-like scale called struvite -the result of phosphorus and ammonia (nitrogen) combining with magnesium – and by consuming up to 25 percent of the system’s capacity. The Clean Water Services’ Nutrient Recovery facility is projected to remove more than 90 percent of the phosphorus in the wastewater and produce 500 tons of Crystal Green® fertilizer annually. Clean Water Services will share revenue from the commercial sale of the fertilizer with Ostara, and it is expected that the initial investment in the technology will be paid back within five years. Crystal Green® is the only slow-release fertilizer on the market with a combination of nitrogen, phosphorus and magnesium (5-28-0 +10% Mg). Crystal Green® is environmentally sustainable, cost-effective for distributors and end-users and proven safe by numerous U.S. universities – including Oregon State University. Crystal Green® was approved for use as a fertilizer by the Oregon Department of Agriculture in 2008 and is being marketed throughout Oregon and the Pacific Northwest. Crystal Green? is an ideal product for turf (golf courses) markets, container nurseries, specialty agriculture and other markets that value slow-release fertilizers. The product’s slow release characteristics provide a source of phosphorus that will not leach into the water table. Clean Water Services is a water resource management utility in urban Washington County, Oregon providing innovative wastewater and stormwater services for more than 500,000 residents. Clean Water Services operates four wastewater treatment facilities; constructs and maintains flood management and water quality projects; manages flow in the Tualatin River; and coordinates regional water supply planning. The Durham Advanced Wastewater Treatment Facility cleans more than 20 million gallons a day of flow from the cities of Beaverton, Tigard, Sherwood, Tualatin, Durham and King City, and portions of Clackamas and Multnomah Counties. In 2005, the U.S. Enviromental Protection Agency named the Durham Facility the best operated and maintained advanced wastewater treatment plant in the nation. For more information, visit the website at www.cleanwaterservices.org.